The third piece of the STORM regulator saga is an adaptation to the STORM OnTank regulator, this version was designed with the BOLT in mind. With a pressure range of 60-200 PSI and it's compact design, it is a perfect fit. It can be mounted on either an HPA or SLP tank. It can also be coupled with the Wolverine CO2 adapter for use with 12 gram CO2 cartridges. It can then be mounted in the stock of some VSR rifles or on the side. 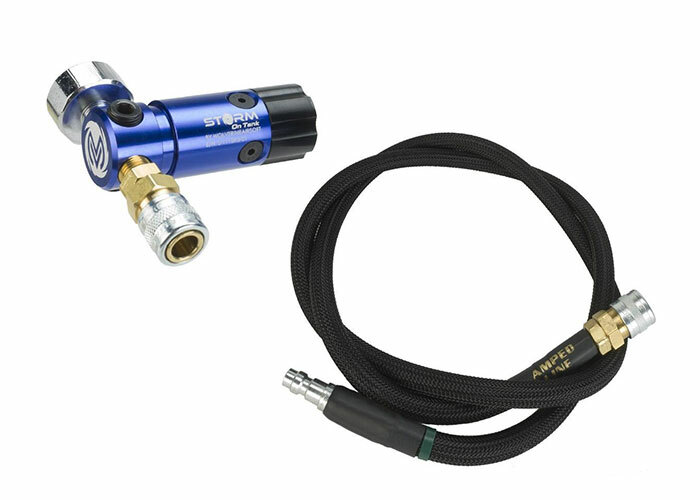 This low profile regulator and line set up is perfect for keeping your High Pressure Air based guns running with minimal footprint added to your load out. This keeps you high speed, low drag and not a bulky mess with some oversized regulator attached to your back.